Here is an example of some small paintings grouped together. I often hear people say they need a large painting to fill a wall space. As an example you can see in the photo by grouping small paintings together you can easily fill a pretty large area. 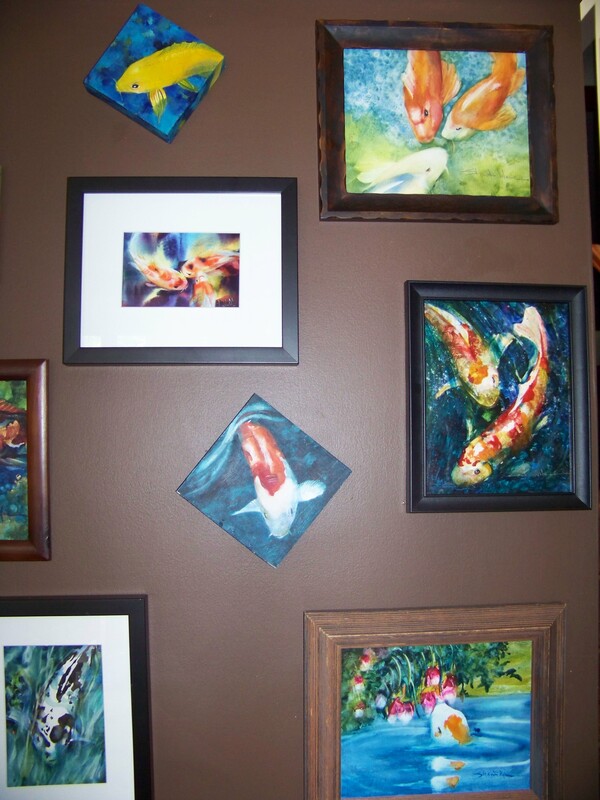 I put up some of my Koi paintings so it tends to read as a theme. But this isn’t necessary, just like home decorating styles the wall can be eclectic. I also used all types of frames but sometimes using the same frames pulls the wall together. Buying small paintings and getting frames for all of them can be expensive but I’ve found these smaller frames are easy to find in your consignment stores, flea markets, yard sales or even thrift stores. This painting is NOT a daily painting but a part of a series called “Living Jewels” . 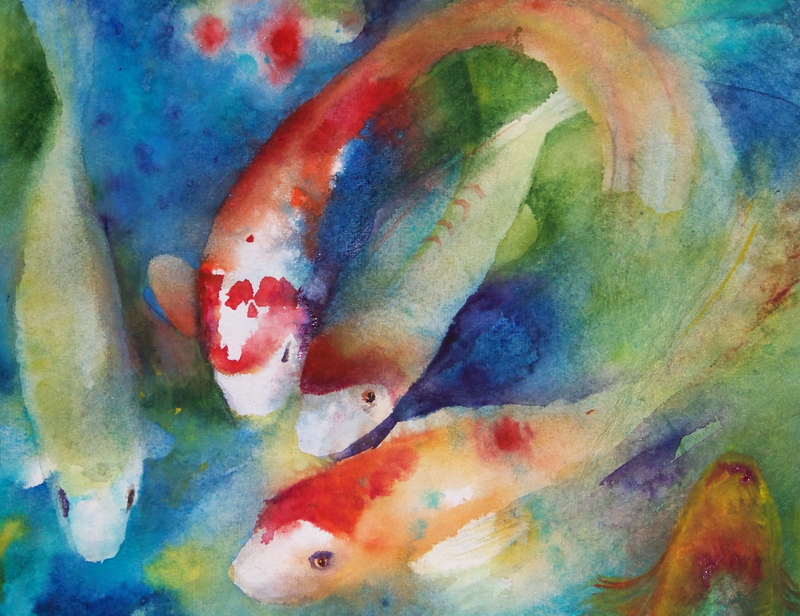 I thought it would be nice for those folks who see my daily paintings to see some of my more challenging and artistically complicated watercolors of which I’m known for. 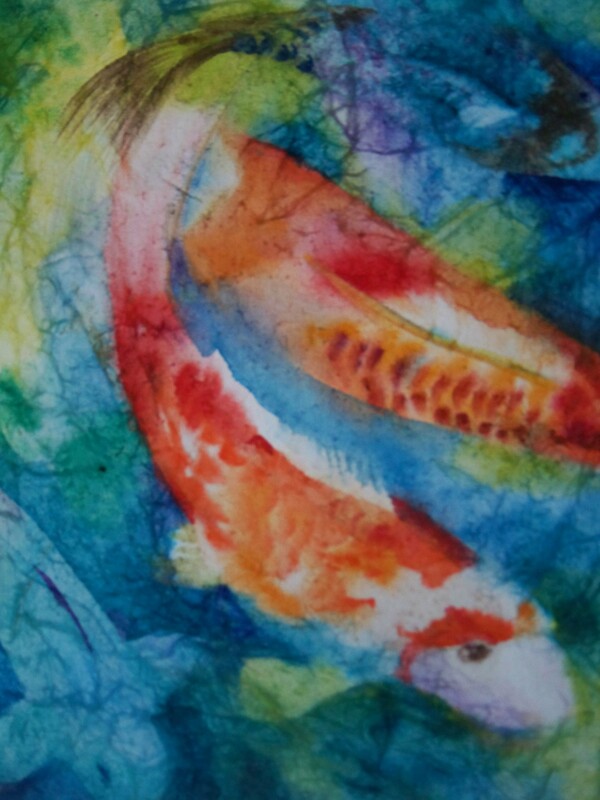 As many of you know I have a koi pond and I love them as pets. Well pets might be the wrong word but I am their care taker. I love watching them because they comfort me and while sitting or standing by the water’s edge, listening to the water fall, I feel a sense of overwhelming serenity like no other thing I’ve ever experienced. Some folks say it meditative, others say its similar to watching a BIG fire on a snowy night. 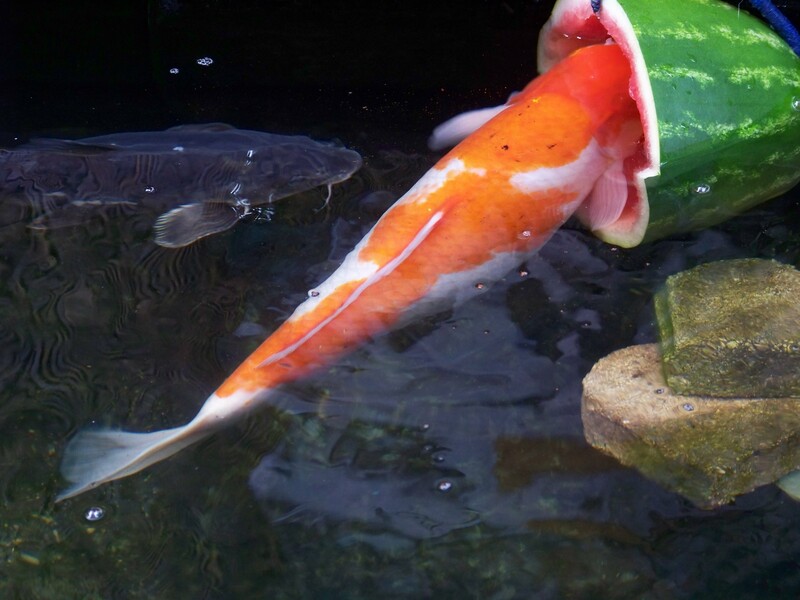 Seeing how much I love Koi you might think it strange that I would eat fish but I don’t think its odd at all but of course I wouldn’t eat my own Koi. Don’t get me wrong I love all animals and of course fish too and yes I eat both fish & meat. I came to terms with that decision many years ago. I decided that I can’t be vegetarian on the grounds of cruelty unless I also gave up using all animal products. This included everything from Jello to thousands of leather products like shoes, belts, & furniture just to name a few. Don’t forget feathers, fur and lots of health products. Knowing it would be too difficult to eliminate all these things I choose to eat meat and fish. I do find it interesting that so many vegetarians eat fish and will not eat meat. A vegetarian diet is a very healthy way to go and it’s good for most people. If healthful living is the reason for you to be a vegetarian, I agree with it 100%. But…. Vegetarians who feel its unfair and cruel to animals to be used as food but think its not cruel to fish bothers me. Its difficult to know what is right, but I have been around fish for awhile and from my experience as a angler and as a pond enthusiast I think they feel pain. I didn’t always think this and my opinion evolved form fishing with barbs to catch and release to not fishing at all. I was indoctrinated in the catch-and-release ethic that was growing around 1990. (The idea of catch-and-release has been promoted by the conservation group Trout Unlimited and other fish sporting groups since the 1950s, yet there are still many parts of the country where fishermen think it’s ridiculous. Back when I started fishing, most folks I met on the banks or out on the lake liked to catch their daily limit of fish and eat them.) I did too on occasion but as I started to really watch the fish and fell in love with them, I wanted to learn ways to avoid hurting them, to catch and release the fish properly. Usually I would use a net with a soft mesh rather than the BIG string like net so as not to pull off any scales. I would wet my hands before handling any fish (so as not to take off the protective slime coat), then gently I removed the barbless hook from its mouth, and swish it back and forth in the water only letting go when it appears it had its bearings (though fish usually just flit away at the earliest opportunity). Like many fishermen/anglers, I had the experience of catching the same fish twice, and it bothered me to see them thrash about but using my softer technique it appeared as if really I wasn’t hurting them; it was as though we were wrestling. After several years of this type of fishing with my husband I decided to do a bit of research and found that the latest studies indicate fish feel pain but can tolerate being caught and released. and their movements are not knee jerk reactions. Research studies backed up the my intuition that catch-and-release worked. Generally, if you don’t deep-hook a fish, exhaust them on the line, hold them out of the water too long, or bash them on the head, they have a good chance of living to fight another day. Most fishermen will admit fish caught and placed in a boats holding tank don’t seem happy thrashing about in the water, and some fish make an unpleasant croaking sound when you’re trying to get the hook out. Seeing them gasping for air, it’s hard not to feel like a jerk sometimes. Finally the 2003 Edinburgh study confirmed that trout have polymodal nociceptors around their face and head—i.e., they have the ability to detect painful stimuli with their nervous system. 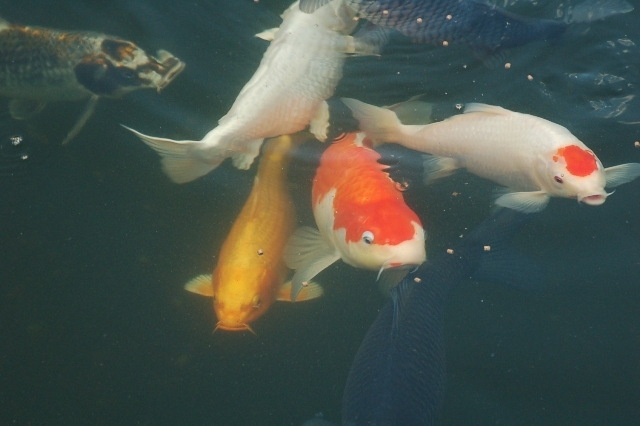 After reading a bit more I found I would rather keep fish in a pond then try to catch them for sport or food. 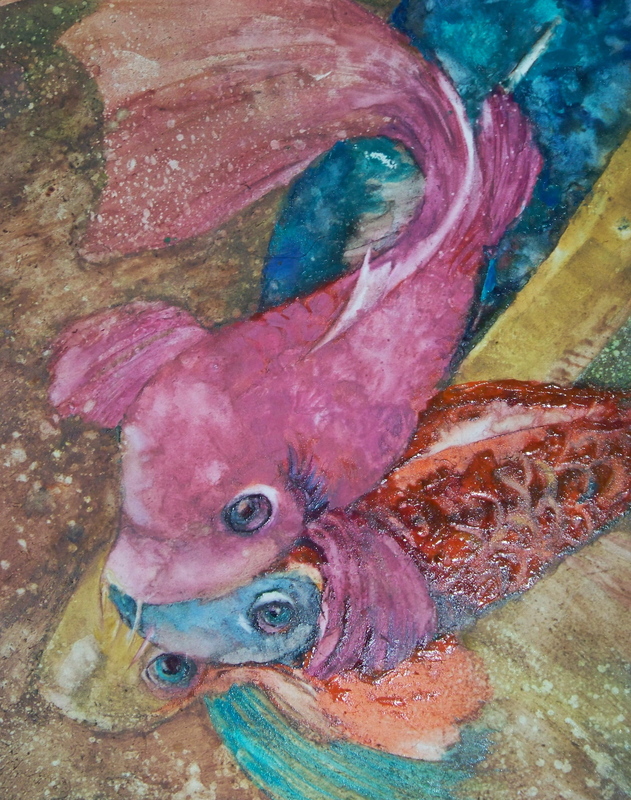 In several places on this painting…the paint is thick and it has a tendency to reflect back to the camera lens. 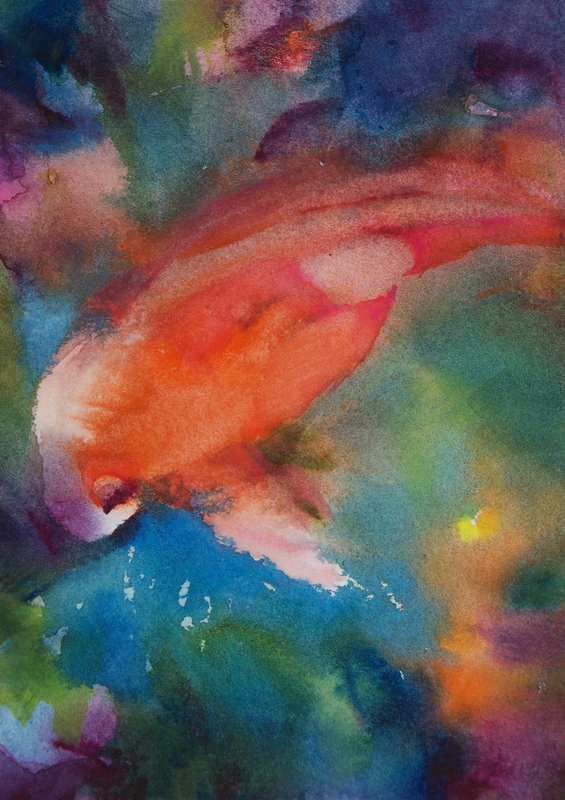 You will see this reflection mostly on the reddish orange fish. In person it does look like this it looks like the thinner paint. 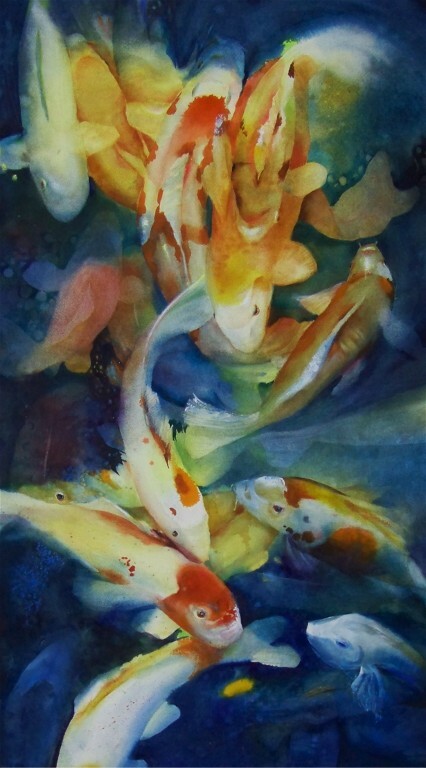 I love painting these Koi just a bit animated or you might say with personality… Koi speak volumes while looking back at me while I peer down at them thru the water. It’s amazing how many actually do look up at me. This will be the inspiration for my next painting.